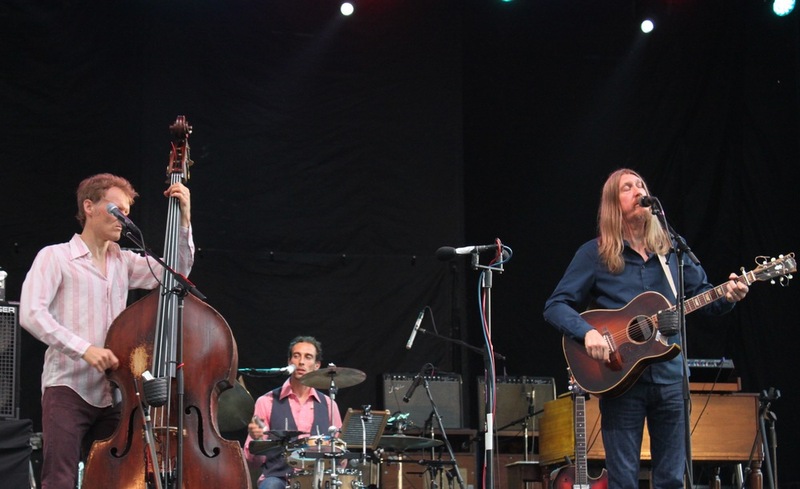 The Wood Brothers perform live at The Lowdown Hudson Music Fest (L to R: Chris and Oliver Wood, and Jano Wix). Attending a free outdoor concert on a Wednesday evening was just the trick to get over yesterday’s hump day blues. We recently dropped by the Lowdown Hudson Music Fest http://artsbrookfield.com/event/lowdown/ (sponsored by Arts Brookfield), down on the southern tip of Manhattan behind Brookfield Place off Vesey Street. The first day (of the two-day festival), both Ryan Bingham and the rustic-rock group O.A.R. performed, while the second night featured the incredibly talented Wood Brothers, who opened for a supergroup called The Word, made up of Robert Randolph, John Medeski, and all three members of the North Mississippi Allstars. Unfortunately, we had to dip out and missed The Word, but we caught the Wood Brothers and their set was truly electric (in the most acoustic-meets-electric way). The Wood Brothers brought their folk-Americana hustle to the Big Apple, and its exactly what the crowd was looking for. The trio, made up of Oliver (guitars) and Chris (upright bass) Wood, plus the ever versatile musician Jano Rix, started off strong and kept going ‘til the last applause. Pumping out some heavy vocals, Oliver gave an interim shout out to NYC saying, “This goes out to all our friends here in the city who have crappy bar gigs tonight! It’s all relative guys.” These three men jammed for nearly two hours and really brought the heat, which was refreshingly complemented by a slight breeze off the Hudson. Their feel good vibes and boot stomping melodies had the venue dancing the night away. Into their latter hour of performing, Oliver reaffirmed the swaying fans that it was alright to move their feet, explaining: “It’s ok if its 7:15… you can still dance!” The Bros played quite a selection performing tracks from a variety of their albums including some highlights such as: “Shoofly Pie”, “When I Was Young”, “Who The Devil”, “Luckiest Man”, “Honey Jar”, and “Postcards from Hell.” Heartfelt lyrics resonated as they masterfully owned their selected instruments. The sound oozed over the stage and into the attendees like a sweet musical honey. A washboard, harmonica, standing bass and unplugged guitar make for a quintessential sound, and The Wood Brothers have mastered that. And word is they’ve got a new album in the works for this fall, so stay tuned by following along on their Facebook, Instagram, and Twitter for updates. In addition to the soul soothing vocals and an eclectic blend of instruments, it was also pretty monumental the gig was free of charge! All you needed was a handstamp from the merch tent, and you had access in. As the sun set to set over the waterside venue, you almost felt you had been transported to a countryside riverbank. 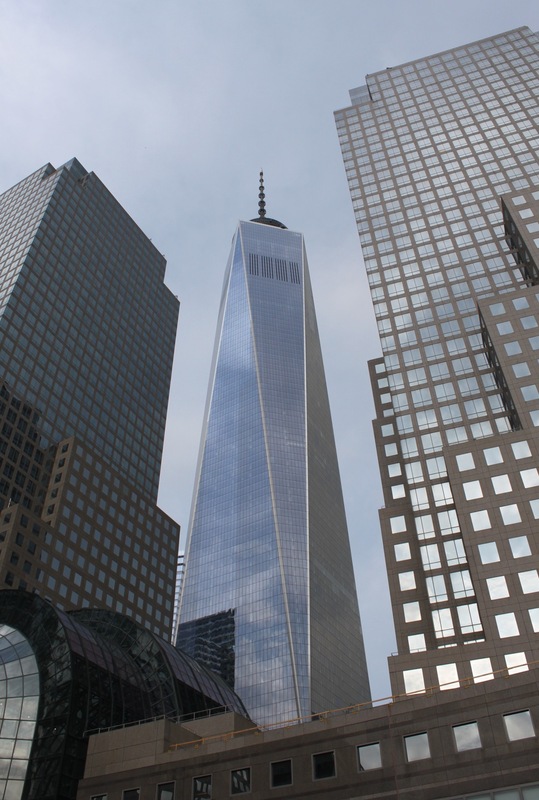 Yet the colossal One World Trade easily reminded us that in fact we hadn’t left New York at all. Overall the show was out of this world, and had always been a dream to see them live. NYC was the last place I expected to catch them, but I’m sure glad I did.